Got questions about XPages? Who doesn't! You already own "Social Business" tools. Now use them. Large enterprises are quickly learning to be more "social." Just about every organization has a Facebook Fan page and a Twitter account (if not multiples of each). Now many of them are looking to take their social media initiatives to that proverbial, "next level". IBM now sees "Social Business" as one of their major business thrusts. Think people, trusted relationships, brands and getting business done. They want to be able to have a much more intimate relationship with their customers, potential customers as well as their own employees. For example, getting their input on a new product or service; seeking ideas for ways to improve an existing product or service; etc. Internally, senior management may look to promote a more open work environment and foster honest discussions about company initiatives. Just the thought of such an undertaking evokes thoughts of an army of silicon valley "social media consultants," countless hours of work and of course a consulting bill to rival the national debt. The solution for many companies, especially those with an investment in IBM Lotus Notes and Domino could be quite easy, painless, and cost about as much as a few executive briefing from some of the major consulting houses. Elguji Software has published a brief paper entitled, "The Social Software Platform Your Already Own." 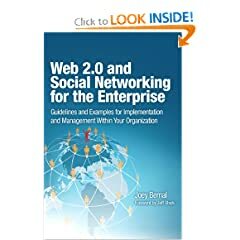 In it, Elguji outlines how a company's existing IBM Lotus Notes and Domino collaboration platform can be easily transformed into a social business ecosystem that tightly integrate your customer's ideas with your company's infrastructure. "The Social Software Platform You Already Own" paper can be downloaded at no charge here (PDF). Explore Elguji case studies, product brochures and product documentation. Earlier this week we updated the elguji.com website with a new look and feel. We also refined the site content and collateral. Soon you will be seeing changes to this blog and the IdeaJam.net and IQjam.net sites. Over the last year or so we have been contacted by many IBM Business Partners around the world with a view to them reselling our *Jam suite of products (IdeaJam, IQJam and LinkJam). As with all things legal, this has taken some time for us to get set up, but, now we are ready and have a partnership program set up. So if you'd like to resell our products or partner with Elguji to help your customers and their "Social Software in the Enterprise" needs then please drop us a line and we'd be happy to talk about the options available to you. For all those unable to attend IBM Lotusphere 2010 in Orlando, PAVONE AG and Elguji Software offer the possibility to learn about IBM's news and trends in Portland, Oregon. We are inviting you to our Lotusphere Comes to You event on March 16, 2010. A few hours of your time will allow you to catch up with the most important news from Lotusphere® 2010. Will also give you a summary of current IBM trends for 2010. We will start at 8:30 AM and end at 1 PM, allowing you to return to work in the afternoon. The event will take place in downtown Portland. Additional information about the location and our agenda will be announced in February 2010. Please use our online LCTY Portland form to register for our Lotusphere Comes To You event. We are looking forward to seeing you at our event. Make sure to register early, as the number of participants is limited to 25 people. If you have any additional questions, please contact: Gayle Elgort. As in the past, emerging technologies fundamentally changed the way companies do business, with the explosion in popularity of social networking websites, Smartphones and an expanding list of mobile applications in 2009. But this year, the real story was how businesses, large and small, public and private, integrated these technological advances into their day-to-day operations. Bruce Elgort, president and CEO of Elguji Software of Vancouver, has had a front-row seat to 2009's accelerating transition from traditional media to a more flexible online marketing model, helping to encourage what he called an inevitable and crucial "online conversation" with businesses about new technology. "Companies are adopting social media more than they've adopted any other paradigm in history," Elgort said. You can follow "@iqjamquestions" on Twitter to see new questions submitted to the The Lotus Community IQJam site. You can also follow new IdeaJam ideas on Twitter at "@ideajamideas". IQJam also has RSS feeds for each and every IQSpace and every Sub IQSpace. IQJam is also now available for purchase as an IBM Lotus Domino template. Learn more about IQJam here. Lotusphere Orlando, FL January 21, 2009 – Today Elguji Software, LLC announced the availability of their new release of IdeaJam, idea management software for IBM’s Lotus Notes and Domino powered by XPages. IdeaJam provides companies with a place where people can post and share their ideas, and gauge the marketability, popularity and viability with voting and input from others. The latest version is the industry’s first application to offer full support for IBM Lotus Domino XPages, enabling businesses to use the most recent Web 2.0 technologies which scale better to support very large implementations of IdeaJam. With support for XPages, IBM Lotus Domino 8.5 customers can choose to run IdeaJam using XPages or classic Domino HTTP. Both ship in the same single template for backwards compatibility, which allows customers to run IdeaJam on whichever version of Lotus Domino they have installed. This support will allow Elguji customers to choose how they want to run their idea management process. All of the new features are part of the continuing, regular commitment of Elguji to provide the features and tools which its customers need to make the most of IdeaJam. “The latest version of IdeaJam is the result of the ideas our customers posted on our own IdeaJam, said Matthew White, Chief Software Architect, Elguji Software. Additional features in the latest version of IdeaJam include advanced search, reporting, web administration, idea archiving, custom messages and improved tag clouds, all features that have been requested by existing IdeaJam customers. Elguji is demonstrating IdeaJam at the Lotusphere 2009 Product Showcase Pedestal 227. Matthew White and Bruce Elgort, members of the IdeaJam development team will be presenting a session at Lotusphere 2009 entitled “Developing A World Class Web 2.0 Application With XPages” in the Dolphin S. Hemisphere IV-V at 1:00PM on Monday, January 19, 2009. There you can learn how they leveraged XPages technology to build “TaskJam” a free XPages based task management application. Elguji software is a member of IBM PartnerWorld located in Vancouver, Washington, USA. Elguji specializes in Web 2.0 and social networking software development. Visit www.elguji.com for more information. IBM, Lotus, Notes, Domino, Lotus Symphony, Lotusphere, are trademarks of IBM Corporation in the United States, other countries, or both. IdeaJam is a trademark of Elguji Software, LLC. "If you thought Elguji was a Japanese search engine, think again"
"If you thought Elguji was just a word used to test your spell checker - think again"
"If you thought Elguji was all about the "old way" of thinking, think again"
Congratulations Haleigh, David and Pawel.